I have observed that sometimes a person thinks our program is like a work book that you hurry and answer the questions so that you can be finished and then you are suppose to be done with your addiction. I kind of thought that myself when I first started and thought that after completing the program I would be like a graduate and just move on. I have found that doesn’t work, or at least it didn’t for me. I really needed a sponsor to help me see where I was getting off track and to encourage me. I also found that when I had completed the program, I still needed to be working so that I could stay free. I am an emotional compulsive eater, so I have found that it is too easy to go back to old habits if I am not working the program. This second time around, I am learning even more and able to help others better. One step at a time works for me and others that I have observed. Thank you for your reminders, Mira. They help me to stay on track. I have learned, while working through the 12-steps, that I am not nearly as patient as I thought. Sometimes I do want to rush the process, skip ahead, finish-up and be “cured.” Ha! Completely devoting myself to thoroughly finishing each step before moving on allowed me to make steady, forward progress. Fear has also been a roadblock for me, apprehension of either a failure to measure up to the requirements of the task/step at hand or aversion to learning something uncomfortable or inconsistent with my own self-image. I must combat fear with prayer to confirm the next steps I take are the right ones, the ones God wants me to take. I also must do things to be of service so that I may have the Spirit with me while I work. “For God hath not given us the spirit of fear; but of power, and of love, and of a sound mind.” (2 Tim. 1:7) I need the Spirit’s presence to do this step-work! Whatever my excuse is for getting stuck in my progress I have to keep a good work ethic about my own effort and be clear about what I’m offering if I am to reasonably expect help from God. I also have to remember who’s plan I’m working and focus on the current step, the one that God wants me to complete. “Change is hard. Rather than going through the struggle to overcome a bad habit or rectify a mistake, some of us choose to make excuses for inactivity. Progress comes as we are able to give up something for something we want more.” (Marvin J. Ashton, Conference, April 1979). Jim, thanks so much for your thoughtful addition to this topic, especially for pointing out the role fear plays in getting stuck. Satan clearly is the source of this kind of fear, and he certainly does not want to see us make progress. He uses every tool he can find to keep us from moving forward. I’m a little confused about where I’m at in the steps. Before I ever got involved with the 12-step program I wrote an addiction inventory/narrative, which is step four. But does that mean I’m ready to “skip” steps 1-3, or that I already did them without really knowing it? I don’t think so, but I’m not sure. I like what you say about involving honest prayer to get the sense from God about where you are. Robert, it is my observation that a thorough working of steps 1, 2, and 3 sets up the rest if the steps. If you haven’t turned your will and your life over to the Lord as thoroughly as possible, steps 6&7 will not be as effective in helping you to let go of your shortcomings as they might otherwise be. 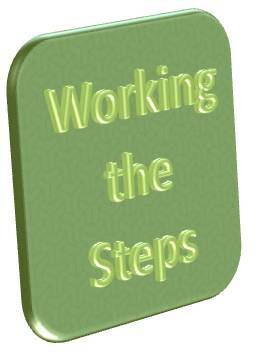 Working the steps is not a race, and there is no advantage in getting “through” them quickly. Take what you like and leave the rest. The Lord will guide your progress through the steps.